On March 19, 2013, 8 high school Mathematics, Engineering, Science, Achievement (MESA) students from North County Trade Tech High School were matched with their university counterparts in the San Diego State University (SDSU) MESA Engineering & Maximizing Science Potential program, based on major and interests. The SDSU students allowed the high schoolers to ‘shadow’ them throughout the day, which meant bringing them along to classes, visiting labs, touring the beautiful SDSU campus, and sharing their college experience (both good and bad). For some high school students, this was their first college experience or their first time on a college campus. 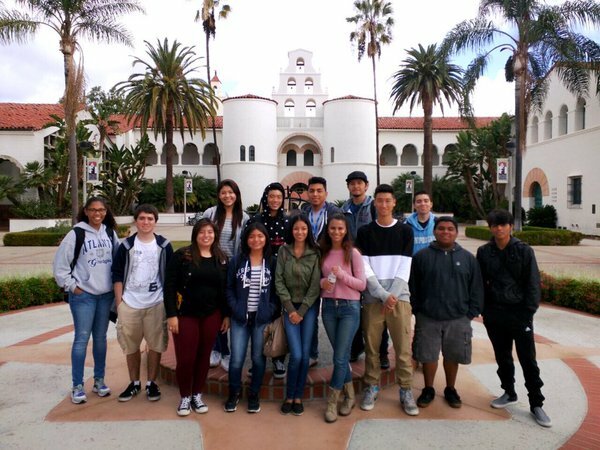 On February 10, 2011, 22 middle and high school students from schools within the San Diego and Imperial Valley MESA Schools Programs visited the San Diego State University (SDSU) campus. The students were matched with their university counterparts in the SDSU MESA Engineering & Maximizing Science Potential program, based on major and interests. The SDSU students allowed the middle and high schoolers to ‘shadow’ them throughout the day. That meant bringing them along to classes, visiting labs, touring the beautiful campus, and sharing their college experience (both good and bad). For many of these middle and high school students, this was their first college experience and their first time on a college campus.